A good-looking indie game called Westport Independent has been released for Android today. In this game, you play as an editor for a privately-owned newspaper. The newspaper is actually controlled by the fictional country’s government. 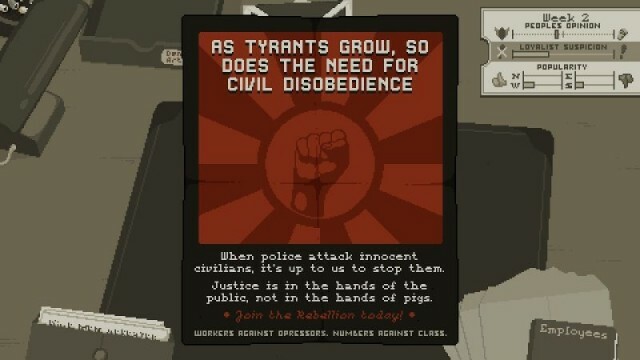 It has sort of a 1984 feel as the intro to the game explains that all news must be presented in a way that pleased the rulers. Your job is to abide by the rules and spin or censor the news that comes across your desk. You can change headlines and eliminate paragraphs to change the portrayal of the article. The choices you make will change how the citizens view the government. You have to walk the fine line between praising the government and supporting the rebellion. Editing a newspaper might not sound like an exciting game, but The Westport Independent is much more than that.This game is all about choices. You may feel a little stressed, but that’s the point. You can download the game for $5 from the Play Store. No ads. No in-app purchases. Get to it, editor.